My Captain and me. No words needed. . . Humor me for just a moment. Please. I need a little humoring because I’m shaken by the news of another man/boy on a rampage with a gun. Nine people, peacefully at prayer, executed. This human, empowered with a weapon, looked at a group of people, judged them by their appearance, and filled with hatred (from who knows where, but I bet he listened to “hate” radio on a daily basis) shot them dead. Oh. My. God. I will put aside my heart for a few moments, broken over the state of “humanity,” to talk about animals. Again, please humor me . . . and take a moment to consider turning a golden retriever loose in this same church. Not for one moment does the retriever notice the color of anyone’s skin, only noticing the content of each person’s heart and soul. I would bet my own soul this dog would trot from person to person, quickly identifying every truly important aspect of their existence, accept them for whomever they are, give them a little lovin’ and then move on to the next person. Each human would feel blessed by their moments with this animal and continue on with their lives the better for the experience. Oh, if only Dylann Roof had been born a golden retriever . . .
I’m using a dog as an example because they are most familiar to all of us, but I work with horses, pigs, sheep, goats . . . you name the farm animal, I probably work with it on a daily basis, and every single animal I have ever met has judged me not by my appearance, but by the content of my heart. I am grateful that, as a whole, they have deemed me worthy of their love. Alas, much of humanity has not been so kind in their judgment . . . Animals aren’t just colorblind, they are “appearance blind.” The only animal on this planet that is capable of hatred based on color, weight, religion, uniform, politics . . . hell . . . even fashion sense, is the human being. If we take a step back and look at us as a species, all caught up in our egos, positive that we each are the only perfect and justifiable example of our kind . . . if we aren’t repulsed, we should be. The world teeters on on the edge of obliteration, and we all know the Rhesus monkey and the duckbilled platypus are not to blame . . . it’s humanity. There are days when I am tired. The work on a farm that rescues animals from the abuses of humans is endless and brutally hard. But in between throwing hay, dumping grain and shoveling manure there are those moments when a horse will stop me in my tracks and rest her head on my shoulder, letting me know how much she appreciates what we do and that she’s glad she’s still alive and landed on Locket’s Meadow instead of in a slaughter house. There are afternoons when I would rather curl up and take a nap than walk over to the barn and teach a riding lesson, but I drink another cup of coffee and tack up our enormous Shire, Ernie, marked for slaughter at 9-months old but rescued by us at the last second. I watch how he gently allows someone like Jim, a non-verbal autistic man, ride him independently around the indoor with only a halter and reins, and I know that I also have landed in the exact right place here on Locket’s Meadow. My horse, Captain, rescued at the age of four months from slaughter, was the angriest, most aggressive colt I had ever seen, with good reason, but when he works with adolescent girls who have been bullied and teaches then how to stand up for themselves with conviction, I understand resiliency and unconditional love. Each time there is another senseless act of mass aggression and I’m left feeling hopeless about the state of the human race, I haul myself back out onto the farm and return to work; the animals need to be taken care of regardless of human chaos. In the barns and in the paddocks is where I learn the most about life and love, forgiveness and gratitude. I learn all of these traits from animals that were beaten, starved, locked up, abused and sent to kill pens to await painful slaughter. It’s on those days when I am most tired and discouraged and considering a life of ease in the suburbs with nothing more demanding of my attention than a goldfish in a bowl that my animals work hardest to remind me of the importance of the job we do. These “lowly” animals are far wiser than I ever will be, and understand it’s crucial for places like Locket’s Meadow to exist to expose humans to these beings and their advanced souls. When God created animals, it wasn’t to give us steak or cheese or pork chops. Animals set the standard for compassion and forgiveness so much higher than we do, and their ability to give back out of love and thankfulness is unlimited. We need to spend more time with pugs, pigs, peacocks and ponies. How else will human beings ever learn the art of judging each other by the content of our hearts and souls, if not from the experts, the animals? Please visit Locket’s Meadow Gofundme campaign – even if you can’t donate, you can share! Thank you! This is me with Baby Bobby shortly after he arrived at Locket’s Meadow. The “stuff” at the base of his mane is big chunks of the glue they use to fasten the USDA sticker to the rumps of slaughter horses. I took some satisfaction from knowing that Bobby fought that sticker so hard they dumped the glue everywhere . . . note the wounds, the ribs, the mess . . .
Five years or so ago we learned about a kill pen on the Kentucky/Tennessee line. The owner was actively purchasing horses in volume from places like the New Holland, PA auction and bringing them to his property where he stored them until he had enough to fill a double decker trailer and send them to Canada or Mexico to be slaughtered for meat. While they were in the kill pen they were inspected by a veterinarian who then glued a green sticker to their hips (using a substance that is impossible to remove, but then, no one really cared because they were going to slaughter, anyways . . .) This sticker meant they were deemed healthy enough to be slaughtered and eaten by humans (please excuse my overuse of parentheses, but every single horse we pulled from there had pneumonia – “healthy” my sweet patootie!) The horses were then packed into filthy, congested corrals where they awaited their miserable demise while they passed around a plethora of diseases. The green USDA sticker is the last step before the end . . . unless someone steps in . . .
For about three weeks we were able to pull horses from this hellhole by offering a little more money to the killer buyer (yes, that’s what they are called) than the going per-pound rate. Almost all of the horses on Locket’s Meadow were purchased by the pound. We managed to get two loads of 10 horses out of there before it all fell apart. You see, after our second rescue load, the hauler showed up with his double decker only to discover there weren’t enough horses to fill it. He threatened to cancel his contract with the killer buyer if it ever happened again, and from then on, we were banned from saving the lives of the horses on his property. Rescuing the first load from this place was a more traumatic experience than usual for me. I can’t personally go to a kill pen or an auction frequented by killer buyers because I can hear the animals’ voices and it’s more than I can handle; as soon as a horse says “please” I am traumatized. . . . The truth is, most of them say please and we can only take so many. In this case, I had emailed the list of the horses I wanted pulled to a contact person in that area, and she cut the deal with the killer buyer for me. I later learned I would have more room on the trailer than expected, so I chose two more from the list and called my contact on the phone on the morning of our pickup. That’s when I found out out the hauler had arrived a day early and my person was desperately trying to get the men to take my horses off the trailer as they were loading all of them. Nothing to panic about, right? During the entire incident my contact’s phone kept cutting out while I tried to give her instructions, and in order to talk to me she had to abandon the barn and trailer to climb a nearby hill. It was an hour of hell, but by the end, we had all the original horses I’d paid for. However, we had lost the extra two. Those loaded and shipped to Canada, and my heart was broken, not for the first time. This is not a vocation for the faint of heart . . .which I suppose I am . . .
Bobby was on that first load, the last horse I had chosen. He arrived at Locket’s Meadow covered with marks from lashes with a whip. Most of them were infected, but he wouldn’t let me get near them – this horse kicked like nothing I had ever seen before. I always ask an animal’s name shorty after they arrive, as anything familiar to them is helpful. This little standard bred, not much more than 2-years old, answered with more enthusiasm than I’d ever witnessed. Dr. Stacey checked him out, with great caution, and diagnosed him with pneumonia, like all the rest of that laod, which worked just fine for me because I didn’t want to get near his back end to treat the lash marks with topical antibiotics. We put antibiotic pills in his food and hoped for the best. Meanwhile, he slowly told me his story. Bobby’s second owner was an Amish man (“the man with the black hat and the beard” as he called him) who was breaking him to pull a carriage, with “break” being the operative word. Bobby did not want to move forward with a cart behind him. He felt that if he did, the cart would run right over him so he erred on the side of safety. His owner decided Bobby had an obstinate streak and opted to beat him from behind until he saw the error of his ways and moved forward as requested. Progress was poor, to say the least, and the owner decided to cut his losses. Bobby was sent to auction and sold for meat, but was pulled by us at the last second. Poor Baby Bobby’s problems were worse than what we first realized. We worked hard at training him, very slowly and NEVER getting behind him (the poor boy has Post Traumatic Stress Disorder from his Amish experience) but no matter what we did, he was so edgy we started to suspect, despite his lack of visible testicles, he might not be fully gelded. Blood work confirmed our suspicion; he was still a viable stud muffin. Shorty after, one testicle miraculously descended. But where was the other? I asked the pony about it, and he replied that he very clearly remembered having it removed – no anesthesia, as is the custom of the Amish who seldom engage veterinarians to take care of their livestock. So when the Amish man later purchased Bobby, he was bought as a gelding, but in truth he was what is known as a crypt orchid, which means a testicle or two were still trapped in the abdomen. A trip to Tufts large animal clinic and an ultrasound soon revealed the first testicle was indeed already removed, so they sedated Bobby and removed the very tardy second one. But alas, the damage for Baby Bobby was done. The combination of abuse, testosterone, time in the auction yard and kill pen and who knows what else, left him permanently scared and scarred. A really smart and handsome young horse was now a dangerous and unpredictable animal, with no prospects for a useful life. What do you do with a horse like Baby Bobby? Most facilities send a horse like him right back to auction where he gets a second green USDA sticker slapped on his rump. At Locket’s Meadow, we opt to love him. We make sure he is groomed and exercised and gets attention, but we are very, very careful to make sure he is handled with care and no one gets hurt. IT WAS NOT BOBBY’S FAULT HE BECAME DANGEROUS! It was the fault of a chain of irresponsible, callous and emotionless human beings who saw Bobby as either a piece of equipment to haul a carriage or a chunk of meat to sell by the pound. Where does a horse like Bobby go? The answer is, he goes to slaughter. Or . . . to a place like Locket’s Meadow, where he is accepted for who he is and cared for and loved for the rest of his life. If Bobby’s story has touched your heart, and believe me, this little horse has captured ours, think about donating to our cause, or at the very least, sharing our gofundme link with someone else who might. Our work is important. Please help us continue. 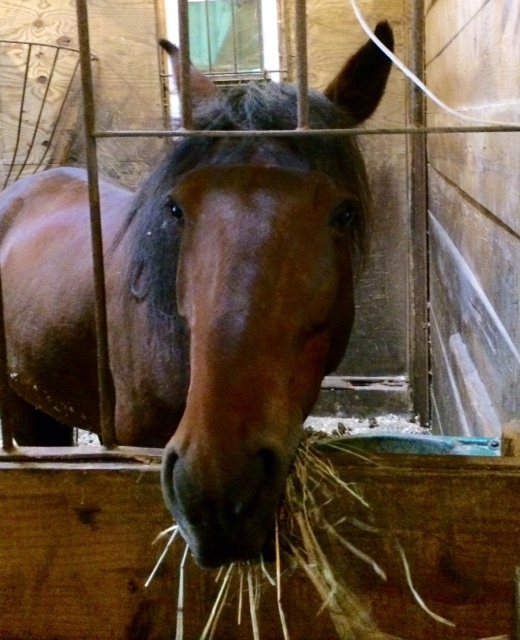 There are fewer and fewer options for horses like Bobby all the time. Bobby at breakfast this morning. 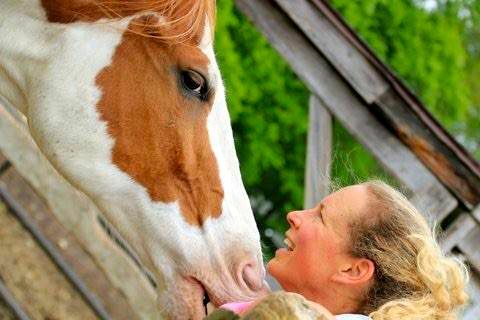 Kathleen Schurman is the owner of Locket’s Meadow Rescue and Sanctuary. She and her husband have spent the past 15 years rescuing farm animals from slaughter, abuse and neglect situations. Currently, they are unable to continue to afford the property and have started a gofundme campaign to save the facility and continue their work. Please help if you can! There I was, minding my own business, strolling across the street to get my mail and wondering how I was going to manage to pay any more bills when . . . Surprise! Surprise! There in my box was another complimentary copy of our illustrious new hometown news source, the Bethany Beacon! How could one small town be so lucky as to get a double dose of so much toxic venom in one month? I checked the front page to see if this one was clearly labeled with the organization and the treasurer paying for the campaign literature and was not disappointed – Nope! It was, yet again, printed on the very back page, on the bottom, in tiny point lettering. It was, yet again, illegally impersonating a real newspaper (and yet again I have already printed out the paperwork to file my second complaint with the State Election Enforcement Commission.) If there is one thing we have all learned from this election, it is NOT illegal to lie in campaign literature, but it is illegal to try to camouflage said campaign propaganda by not labeling it thusly. I couldn’t bring myself to read the entire piece of “literature” because I find the nastiness of the tone so upsetting. I’ve lived in Bethany for 15 years and have never seen anything like this. Hell, as a journalist I’ve covered elections in Milford, Stratford, Hamden . . . seriously politically contentious cities . . . and I’ve never experienced anything quite as vicious as what the Republicans are doing this election season. What ever happened to running on your merits? Your accomplishments? Your qualifications? Your ability to trash your opposition with nasty half-truths? Oh wait, they’ve got that covered . . . Despite my reservations I perused the front page during lunch (again, a front page devoid of the appropriate identifying information) and almost choked on my spinach salad. The headline read, “Working to Obtain Transparency of Town Finances.” Did they really want to go there? Once again they are trying to accuse First Selectman Derrylyn Gorski of hiding, embezzling, misappropriating, or whatever, state grant money awarded to us to build a highly anticipated community center that a bipartisan committee has devoted THOUSANDS OF HOURS to bring to our town. A completed investigation cleared Gorski of any wrongdoing and firmly stated that she didn’t have to give the Republican selectmen or the town treasurer access to any of it. Which was cool, because here’s what was happening behind the scenes and the reason the funds had to be kept separate. At a BOS (Board of Selectmen) meeting, the Republican selectmen stated that they had no intention of ever signing any checks made out to any vendors involved with the airport hangar project, of which they do not approve. They then followed up with an email to Gorski emphasizing their intentions. Because for some reason they don’t feel we deserve a community center (you know, like every other town has) they planned to stall the entire project. By then, they had already refused to sign other checks and held up payments to town vendors, causing quite a bit of embarrassment for everyone; they weren’t bluffing. The selectmen had proven more than capable of holding town money hostage. At this point, you may still be wondering why our first selectman didn’t race right down to the bank to give away signing privileges to anyone who wanted them . . . but I hope not . 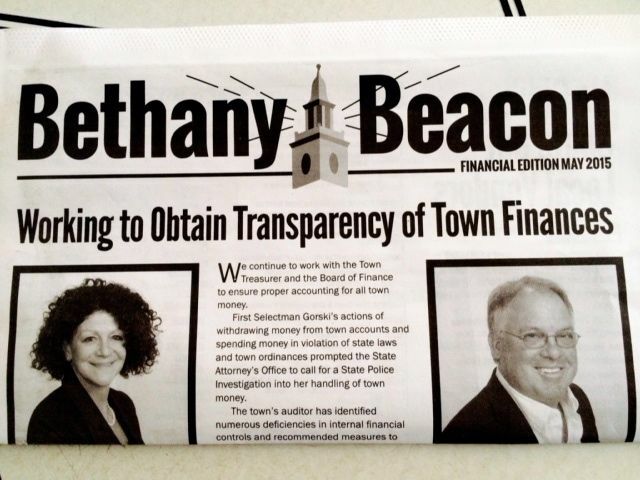 . .
I’m not sure why the Republican selectmen take such issue with Bethany having nice things that are paid for by grant money. Whatever party you belong to, the truth is we have a first selectman who knows how to write for grants and get them. Grants are FREE MONEY. The Republicans keep making snarky comments about Gorski’s “pet projects,” such as the playground and the hangar. Someone has yet to explain to me . . . why the hell don’t Bethany resident deserve these things, paid for with FREE MONEY, maintained by the public works department whose job it is to do this, anyways (it’s not like they had to hire any extra people to babysit a playground 24-7.) We use the new pavilion! We use the playground! We use Lakeview Lodge! And we will use the community center when it’s done! But here’s what really irks me – I know, you thought I’d already spewed that out . . . but . . . no . . . I dunno. Maybe it’s just me. Maybe I’m a little overly sensitive in my menopausal years. But if you want to get snarky about transparency with the town’s money, well, there’s a little more transparency for you! But enough of this – I’m going to feed my horses and then take a walk up to the airport grounds and admire our new community center as it grows before our very eyes. I voted for it, you know . . . oh yeah, all of us did . . . The junior selectmen voted for a referendum one week before the Town Meeting without notifying the Republican controlled Board of Finance, their own people. The budget failed the vote and went back to the BOF to be reduced. Most things in the budget are fixed or essential expenses and couldn’t be touched except for the roads budget. The previous year the town had been part of a pilot project for road pavement management which was presented at the town meeting. Residents spoke in favor of the work and the funding. Every vote to spend the money was an “Aye”. And then – all of this work and promise was completely undone by the last-minute referendum, which forced the BOF to ax the roads funds. The referendum vote had nothing to do with saving tax money and everything to do with losing badly-needed road repairs. Anyone who attends Bethany’s BOF meetings and town meetings knows we don’t exactly have a fat budget. Most of the boards and committees are submitting flat budgets as it is. The town had no control over the increase last year as most of it came from increased enrollment of Bethany students entering the Amity school system. Debt service can’t be touched. As the BOF found last year, the only place to cut the budget was roads, and RESIDENTS ARE AGAINST THAT! But because the budget hacking was done at a BOF meeting and not a town meeting we lost our say. This would be funny, except it’s not. The town didn’t have to pay for the removal of contaminated soil because of the community center. They had to pay for it because IT HAD TO BE DONE REGARDLESS. The hangar was condemned and had to come down. When they removed the cement slab they discovered that two administrations ago, gas tanks had been removed and the area wasn’t remediated, leaving contaminated soil. WITH OR WITHOUT THE REBUILD THE SOIL HAD TO BE REMOVED. Period. Exclamation point. WTH? Here’s the continuation of the misleading “Taxpayers Paying for Hangar” headline, except this one is a flat-out lie. Like, pants-on-fire lie. The money for the removal of the soil came from the contingency fund, which, had the selectmen paid attention at the BOS meeting where it was discussed, they might have remembered. The engineering costs came out of the “Consulting Engineer” line item in the budget. The road budget wasn’t touched, it had already shrunk dramatically because the Republican selectmen forced a referendum, not because of the airport hangar. Well, everyone likes this idea, except the school board is completely separate and the selectmen don’t have a lot to say about it, aside from requesting the BOE budget be kept as low as possible. After that, it’s all up to the school board members. The townspeople voted against an addition to the building and that ended that – none of the selectmen had anything to do with it. About four years ago Derrylyn Gorski looked into curbside recycling and found it would cost the taxpayers a half mill in taxes, which was pretty steep. There is now a bipartisan committee working to find a remedy. Don Shea is a really nice guy, but he’s only one of a group doing the work. Claiming so much credit for the efforts of many is . . . tacky. Here is where they accuse the first selectwoman of trying to bring high-density housing to town. The story is this – years ago a private, non-profit organization was looking to build affordable senior housing in town near the airport. Because it was private and there would have been no federal regulations, it would have been legal to restrict it to Bethany residents or relatives of Bethany residents. A bipartisan committee including residents who lived near the site was organized to study it. There were problems with the septic, so it was never even presented. But – if you claim you want to take care of Bethany’s seniors, providing affordable housing for them is not a bad place to start . . . nor a bad use of a little open space . . . oh yes, and for the record, the only high density housing project in town, Green Haven, was approved by the Republican led P&Z. Which is fine by me – I kinda liked the idea. And there you have it. My intention is not to be nasty – I like everyone involved, and I believe they are good people. But . . . if you run for public office you should base your campaign on ideals and ideas, maybe even offer a PLAN or two. I don’t know whose idea this was or who wrote the copy for it, but I saw none of that in the Bethany Beacon. The only apparent plan was to spread as many lies about the opposition as possible, displaying a total lack of integrity, and worse – the Beacon was an insult to the intelligence of every member of this community in its assumption that we would actually believe all that crap. There are still a few weeks left in this campaign; I hope this was the last piece of campaign literature of this kind. PLEASE let it be he last. Far too many of us were embarrassed to see this degree of maliciousness happening in our beloved Bethany. On this Memorial Day weekend I am grateful to those who made unspeakable sacrifices so that we may continue to have the abundant freedoms we enjoy, and sadly often take for granted, in this country. For me, few things are as important as the freedom of speech and of the press, as these are the tools we were given by our founders that enable us to question hypocrisy, expose fraud, fight tyranny, and yes, even express our own opinions without fear. This weekend, I am writing a blog BECAUSE I CAN. How lucky am I? How lucky are you? I am not a politically active person. I never have been (although I do follow politics because, well, everyone should.) You will NEVER see my name on a ballot, although for a dozen years you may have seen my byline on hundreds of articles covering local politics in more than a dozen towns. I work hard to be unbiased and present the views of everyone involved, and I seldom write an opinion piece about politics, aside from one snarky column about Milford Public Works pretty much napalming the courtyard at the Parson’s Complex. Last week I wrote a blog about showing up at Bethany Town Hall to vote on the budget only to learn I wasn’t going to get to vote, and that the Board of Selectmen had voted two-to-one to send the vote to a referendum. I wasn’t the only one who was angry. On my way in I passed a mess of people who were storming out, not so much because of the referendum, but because they were not told about the change. I was also pretty pissy. Think about being told someone was throwing a birthday party for you complete with a chocolate mousse cake from Julia’s Bakery, only to be told as you walk through the door that they’d decided to serve the cake in two weeks, instead, so here, have a glass of lukewarm water. With a slice of old lemon in it. Drink it and like it, dammit, it’s for your own good. I then wrote a blog that clearly stated I was pissy about the lack of communication, NOT about the referendum. The way selectmen Aileen Magda and Don Shea handled the situation may not have been illegal, but it was inconsiderate and unprofessional. Am I going to stamp my feet and call them names? Not at all. I think they made a really poor decision, but the truth is, I like Aileen and Don and I believe they truly care about our town. However, after a dozen years of covering local politics in the New Haven and Bridgeport area and seeing the good, the bad and the indifferent, I have developed an opinion. Because I am lucky enough to live in the United States, I get to write it and post it. So here’s what I believe, and it has less to do with politics than with being considerate and polite. If Aileen and Don have a long-held belief that the townspeople of Bethany are best served by a referendum to pass the budget, that’s great. However, if this is the case, something as important as such should really have been part of their campaign, and our first shot at voicing our opinion of this would have been in the voting booth. I don’t remember seeing anything about it in their campaign literature, but if I am wrong, I would appreciate being corrected. If, as they say, they were approached by many townspeople requesting a referendum due to their inability to make the annual town meeting, that’s totally valid. BUT . . . say 50 people spoke to them about it. That’s hardly a representative number. Neither is100. In fact, it wouldn’t matter how many people approached them because there was nothing official or documented about it (and those who don’t want a referendum didn’t have a voice – why would they approach anyone about anything when they were still under the assumption they would get to vote at the town meeting?) In any case, if they believed the right thing to do was to call for the referendum I would hope they knew this more than a week before the meeting. In fact, instead of sending out a mailing about the airport hangar, which the town had already voted on and approved (I not only covered that meeting, I voted “aye”) they could have broached this subject instead. I stated in my previous blog that even though the selectmen couldn’t act until the call to meeting was signed, they could have given a heads-up as to what they were going to do at the April 28 selectmen’s meeting since being the majority on the board made it a done-deal. I could still have gotten that information into the Bulletin, which didn’t go to press until a few days afterwards. Aileen’s suggestion to send the Bulletin to press a few days early (actually, more than two weeks) was impossible. Period. A town mailing ($700) could have been done, but after a Monday night vote the soonest it would have hit mailboxes was Friday or Saturday, possibly as late as Monday, and that’s if the printer wasn’t backed up with other work. A reverse 911 call, as mentioned at the town meeting, is hardly appropriate. When I get one of those I just about pee my pants as I’m sure there’s a tornado approaching, a gunman running loose on school property, or at the very least, an Amber Alert. No thanks . . . I have far too many panicked moments in my life without that. So I will repeat what I’ve already stated – if there was no way the town could be adequately informed about this dramatic change in the town meeting agenda, then it shouldn’t have been done. The more professional options, if a referendum means that much to the selectmen, were to discuss it as part of their campaign, send out a mailing well in advance, give a heads-up at an earlier board of selectmen’s meeting, and if none of that could be done, don’t do it at all. They will be in office for another entire year during which this could be addressed, and even better, they could have worked to give Bethany voters a say as to whether or not they want a budget referendum by making it a ballot item; then we would really know if the majority are in favor of it. I will vote on the budget whether it is at a town meeting or a referendum. Period. 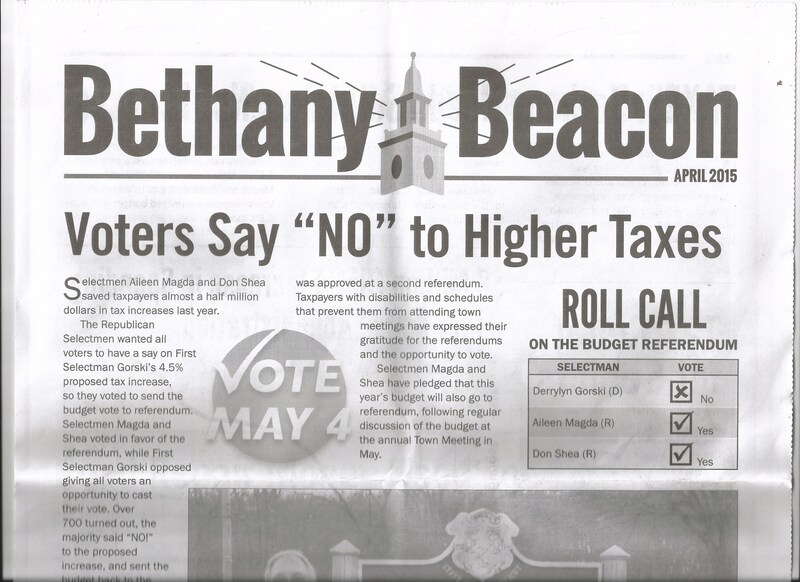 If the voters of Bethany unanimously decide they want a referendum, that’s just peachy. I have no problem with that. But the way it was handled was sloppy, unprofessional and impolite and made a lot of people angry on both sides of the political aisle. In a blog, Aileen wrote about her feelings that the board of selectmen was being run in an unprofessional manner. I don’t know if that’s the case as I have not attended any meetings this past year, but if it is true, the antidote to that isn’t more of the same. But this Memorial Day, I have a voice and I have a vote, and I am not afraid to use either. I am one of the most fortunate people in the world; I am an American and I am not afraid to use the power that our Constitution gives me. And above that, I am not afraid to say I would appreciate a little consideration and forethought by those who represent me in Bethany Town Hall because I take my voting very, very seriously. And lucky you, you get to voice your opinion, too. In fact, in honor of those brave individuals who died to preserve our freedom, maybe you should. But please, a little consideration . . . let’s be polite. After attending last night’s Annual Town Meeting, still reeking of barn, horses and other assorted farm odors, I sat up in bed for an hour fighting back the journalist in me. It was an ugly, bloody battle, and in the end, I lost. I had toyed with ways to word the op-ed piece I would write if still at a regular news group instead of the non-political Bethany Bulletin newsletter. I toyed with “Bethany Held Hostage by Political Terrorists,” but that was a little extreme and clearly a side-effect of the large glass of red wine I sucked down upon arriving home. And yet . . . this morning . . . it still seemed vaguely appropriate and that was after my third cup of coffee, which sadly did not get rid of my headache from the red wine . . . But let’s back up to last night . . . I finished teaching my therapeutic riding students before 7:30 pm, took care of the horses, raced back to the house, brought Petunia Buttercup (a 550 pound pig) into the house for the night, put blankets on outside pigs, fed parrots, and, in short, raced around like a nutcase so my husband and I could get to this meeting and be a part of the vote we love so much . . . how cool is it we live in a place with a town hall form of government where “Aye” holds so much weight? And where, when we arrive an hour late to a meeting wearing dirty jeans and work boots, topped with worn flannel shirts, not a single person looks at us askance or with judgment . . . only last night, we arrived to learn that there would be no vote on the budget. “Incensed” does not touch the way I felt. So here’s the story I have pieced together as to how this came about. The Board of Selectmen held a regular meeting on May 12. There was no agenda item regarding a referendum, but at the end of the meeting Selectman Aileen Magda made a motion to take the town budget vote to a referendum. She was corrected and told she had to first make a motion to add the topic to the agenda, which was done, and then there was discussion, followed by a vote. She and Don Shea, the Republican selectmen, voted yes, while First Selectman Derrylyn Gorski voted no. Aileen and Don said their reasoning was because many people could not make it to a town meeting in the evening and more people could vote on the budget at a referendum as they could vote during regular election hours. Also, they said the senior bus would not run at night when so many seniors don’t like to drive (under special circumstances, if needed, the bus actually could be used in the evening.) Whatever. There was absolutely no effort made to inform the public of this change, and only a few residents knew there would be no budget vote at the meeting. There had also been no mention of a referendum at the Board of Finance meeting when public input from the Town Budget Hearing had been incorporated into the budget. The request for the referendum had come out of the blue, with no hope of stopping it. So here’s what happens next . . . the referendum, which is set for June 2, will cost $2,000 for staff, ballots, etc. The postcards to inform voters of the referendum will cost about $700 with postage. Several scenarios would follow. If the budget passes, the town has to meet again to vote on the capital projects. That will require a mailing of several pages at a cost of about $1,200. If there is another referendum requested to vote on the capital expenses, there is an additional post card mailing at $700 followed by another $2,000 to staff and supply the polls. IF THE BUDGET DOES NOT PASS AT THE REFERENDUM . . . there will have to be another referendum (see pricing above) and we start from scratch This can go on for a long time, at pretty significant expense, until a budget does pass. But wait . . . there’s more. Because the town tax bills must be in residents’ mailboxes by July 1. If the budget passes the referendum, it’s still two weeks before the town can vote on capital expenses, bringing us to mid-June. Codes that would have to be entered to add the new discount to tax bills for seniors, if the budget passes as-is, and then everything gets sent out to a vendor for printing, bringing us in just under the wire, IF THE PROCESS IS COMPLETE AND WE HAVE AN APPROVED 2014-2015 BUDGET. If we don’t, the real problems begin. The tax bills will have to go out regardless, but using last year’s budget, which was approved using a pre-reevaluation grand list that was much higher than this year’s. Tax bills will not reflect true tax payments until the budget is approved, and then, a revised bill will have to be sent out at a cost of an extra $5,000, followed by a lot of confusion for residents getting this second bill. All of this is expensive and sloppy, and it gives me yet another headache which, when I am done writing this, I will try to drown in a large glass of red wine, but first . . . my own, insignificant opinion as to what happened in my beloved town of Bethany. I truly don’t care what political party anyone is in. I was raised by staunch Republicans who proudly wore their NRA patches on their jacket sleeves. I have always been registered as an independent and split my tickets all over the place, and only recently registered as a Democrat so I could experience voting in a presidential primary, which was a delight, as I LOVE to vote. I repeat – I DON’T CARE WHAT PARTY ANYONE IS IN. And I happen to like all of the people involved very much. BUT . . . on the evening of May 12, when the referendum won the vote at the board of selectmen meeting, it totally smacked of passive aggressive manipulation and political grandstanding. Everyone knows we have no traditional press coverage in this town and the Bulletin had already been delivered for the month. There was absolutely no way to get the word out to the town, and there was no attempt made, (although at the town meeting Aileen did mention perhaps a reverse 911 call could have been placed explaining it, but that the possibility wasn’t discussed at the board meeting.) Knowing that no one would know what they were walking into when they showed up at the town meeting, the selectmen still voted for a referendum. Why? They couldn’t possibly have come up with the idea on the night of May 12 and just tossed it out there for kicks and giggles. They HAD to have had a clue weeks earlier, when we could have included it in the Bulletin and informed the public. Even if they couldn’t vote for it earlier, Don and Aileen knew they were going to win it 2-1, so why not give their fellow townspeople a heads up? It would have been the polite thing to do . . . I know that at Board of Finance meetings and the town budget hearings Aileen has lobbied to get rid of the Bethany Bulletin as she feels it’s just too expensive for the town to carry (with ads and absorbing the monthly cost of Seniority, it doesn’t cost any more per year than what the minimum referendum process will be, about $6,000.) It’s no skin off my teeth as I do it as a volunteer and it would free up about 25 hours of my month if she actually won that battle. However, if an ill-informed public was what the founders of our country had in mind, they wouldn’t have penned their famous little ditty about freedom of the press. I understand the selectmen’s point about involving as many people in the budget vote as possible, but their approach was absolutely wrong and pissed off a lot of people, me included. The potential for a referendum should have been addressed months ago, publicly, and not snuck by at the end of a meeting. And here’s what really upsets me (yes, there’s more!) Every town resident had plenty of notice of the town meeting, in accordance with state law. I am flat-out busy from 4:30am to 9pm at night with my many jobs and duties. I made attending the Bethany Town Meeting a top priority and turned my life upside down to get there to vote, to the point of offending nearby residents with the odor of horse manure on my boots. If I can figure out how to get there, just about anyone can. Excuse me while I pour that big glass of red wine . . .
Sue’s Eulogy, for those who could not be there . . . The Tin Man had taken a long and treacherous trip down the Yellow Brick Road only to be told his fondest desire was going to cause him a lot of heartache. Which we all understand, as everyone present today has, at one point or another, walked the Yellow Brick Road of Life with the very special Susan Ives. There are so many things about Sue that we will carry forever in our hearts. She always thought the best of everyone and worked hard to see things from their point of view . . . right up until they proved her wrong, of course. She may have laughingly called herself Silly Sue, but she was wise enough to understand who she should spend her time with and whom she shouldn’t. Sue always made everyone feel comfortable in her presence, and thought more about other’s feelings than her own. Even as she was dying, most of her fading strength was focused on making sure the people around her were at ease with what was happening. Sue was fine with impending death, and looked forward to being with friends and family who had crossed over before her. She often told us not to worry, she’d be right there, working hard for all of us from the other side. And we know this it true, because Sue always kept her promises; we have a dedicated heavenly advocate watching over our shoulders every moment of every day. Sue’s obsession with making sure people were comfortable even extended to this eulogy . . . she requested it be kept short so no one would become uncomfortable sitting in the wooden pews for too long. Most of us, however, would probably agree if anyone deserves a long and splendid tribute, it’s Sue, and since she’s unable to tell us to stop making a fuss over her at this precise moment, we’re going to make sure we all leave here satisfied with these memories of her. We’ll start with the ruby slippers. Over Sue’s hospital door hung a pair of ruby slippers, reminding staff that Sue was at risk of falling. This wasn’t news to any of us, as over the past 25 years or so we’d all seen her walking around on crutches more times than we could count. The hospital falls were different, however, as it wasn’t just Sue being klutzy – it was Sue trying to hold onto her last bit of independence and do things for herself. Heaven forbid she be a bother to anyone, especially for something as mundane as getting to the bathroom. As the cancer progressed for Sue, the attack on her bucket list reached fever pitch. While Hawaii was out of reach, Bermuda beckoned and Sue packed up her shorts and wheel chair for the vacation of a lifetime with her family. “She had a 5 star hotel with down comforters and pillows in a room literally next to the elevator. And then the life-long wait for her duck tour was over. She had an ear to ear grin the entire venture and Jamie occasionally pretended to look at scenery because her eyes were welling up to see her mom so happy. Sue even managed to sit in a car for a six hour trip to Virginia. She didn’t necessarily get to see a baby alpaca be born, but she got to hold a 4 day old cria on her lap, and it was a beautiful picture. When looking back through her high school yearbook, Jamie noticed that her mom had crushes on nearly half the boys in her class. Right up to the end she would turn back into an awkward teenager when reminiscing. Sue was around 60 when she met the movie star Keir Dullea for the first time, and even though she’d had a week to get used to the idea of meeting her teen crush from the movie David and Lisa, her hands shook, her knees knocked and her voice trembled. She actually had to sit down and compose herself afterwards, yet she smiled for weeks afterwards and treasured the moment. Sue’s life revolved around those she loved so beautifully and well – her children, her family, her friends and her animals. She was always at her children’s sporting events, drama productions and band performances. She often became assistant coach or stage manager, never turning down an opportunity to be involved in their lives. Sue was the ultimate cheerleader. She took in a pair of unwanted cats, one of which turned out to be diabetic, and scheduled her life around his injections. She adopted a PMU colt that was destined for slaughter and obsessed over his soft hooves and sore back. She purchased an alpaca that she kept in VA with her brother Chuck and Sister-in-law Sue, visiting every year and making a fuss over Miss Wise’s babies. Sue was the superlative mother to all. Your mom taught me through her actions that all children need to be protected as if they were our own, and often put herself in an uncomfortable situation so I could be spared embarrassment or discomfort. She really listened when I talked and I knew whatever I said was safe. I would babysit for you and one day you were in a bad mood and your mom said, “It’s okay of you don’t give me one now, but sometime today I need a hug.” You went upstairs, but 15 minutes later you came back down and silently walked over and hugged your mom for a long time. Then without a word you went back upstairs with your shoulders a little lighter. Sue explained that she never wanted you to do something you didn’t feel, but she had told you what she needed. When you felt it was the right time, you’d hug her because you wanted to, and then she was happy. Sue made me see that the best mothering is based on intuition, communication, and knowing your audience! She taught me that simple things are sometimes the most meaningful, that casual conversations and treating people with respect, no matter their age, can make a huge difference in someone’s life. This is how she taught me how to be the mom I wanted to be. Kathleen looked at her and said, “If that’s all it’ll take, then he’s yours!” And thus began the greatest love affair of our Sue’s life as she was never as happy as when she was when with the pony she had wished for since she was a child. “Nothing compared to the smile she had when around Bart. Their first reunion was in late February. It was the first time she’d seen him since October of 2009. Bart sniffed and snorted with happiness, then removed his mom’s hat and was startled by her “Darth Vader” appearance, but he rubbed his muzzle over her head and realized she was the same handicapped woman who loved him unconditionally. Just without hair. The second visit – same huge grin! In the end, her spirit remains. Which one of us hasn’t felt her lurking over our shoulder in these past few days since she left us? We imagine that soon after crossing to the other side, aside from a visit to her beloved Bart, who would have been her first visit after embracing Jason and her parents, she managed to get in a trip to Hawaii and Ireland, the two “misses” on her bucket list. In the past months Sue managed to orchestrate quite an elaborate funeral production. Every single thing she wanted- the Calvary tribute, the flowers, donations and the songs were all hand-picked by her. 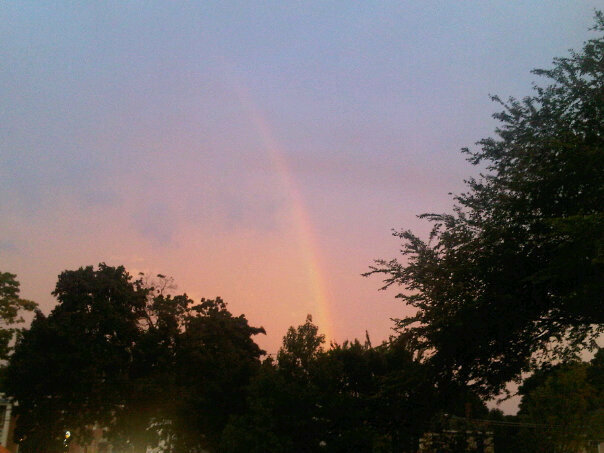 Even the things Jamie wasn’t sure could be accomplished, such as the writing of this eulogy by one of her best friends to the musicians and even a freak weather event like Hurricane Earl and a gigantic rainbow last night as people began to exit her wake. . . all lined up with little effort. Sue could not have made a more grand exit. And if anyone deserves to make it to the Emerald City in such fine style, driven in a cart pulled by the Horse of a Different Color, it’s our Sue.